The number of Americans with Alzheimer’s disease will reach a staggering 14 million by 2050 (1). Certain factors contribute to risk, including lifestyle, diet and genetics… In particular a genetic variant known as APOE4. This article attempts to explain the link between diet, the APOE4 gene and Alzheimer’s in plain English. 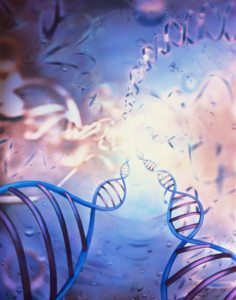 What is APOE and the APOE4 Gene? Scientists have found several genes that increase the risk of developing Alzheimer’s disease (a form of dementia). One of those is the APOE gene, which tells the body how to make a protein called apolipoprotein E (APOE). The terminology is confusing as the gene and protein have the same name. The APOE protein carries cholesterol and other fats through the blood. If we eat a high-fat diet, our bodies make more APOE. APOE is also found in the brain. It’s important for brain development and repair of brain structures after injury or inflammation (2). There are three major variations (alleles) of the APOE gene- called APOE2, APOE3 and APOE4. We are each born with two alleles at the APOE gene and can have any combination of the three different alleles. For example, we could have E2/E2; E2/E3; E3/E3; and so on. These APOE gene alleles produce slightly different forms of the protein Apolipoprotein E. Click to enlarge. Image source. Studies indicate those with the APOE4 allele are more likely to get late-onset Alzheimer’s disease than others. Those with two copies of the APOE4 allele are at even greater risk (3). Having the APOE4 allele does not mean a person will definitely develop Alzheimer’s – it just increases the likelihood. 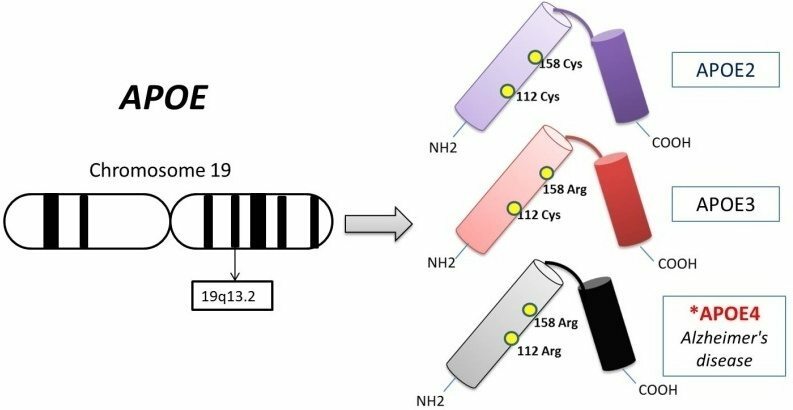 Summary: The APOE gene produces the Apolipoprotein E (APOE) protein, important for brain function. Inheriting a variation of this gene called APOE4 increases the likelihood of developing Alzheimer’s in old-age. Having two copies increases the risk even further. Although having the APOE4 gene variation is clearly a risk factor for Alzheimer’s, scientists are unsure why. A number of rodent studies have shown those with APOE4 have cognitive issues and more trouble learning than those without. In one experiment, mice with APOE4 did worse on tests of spatial learning than mice with APOE3. This was especially true in the female mice, and may also be true of humans (4). The accumulation of tangled bundles of fibers in the brain, called amyloid plaques, is another main feature of Alzheimer’s disease. 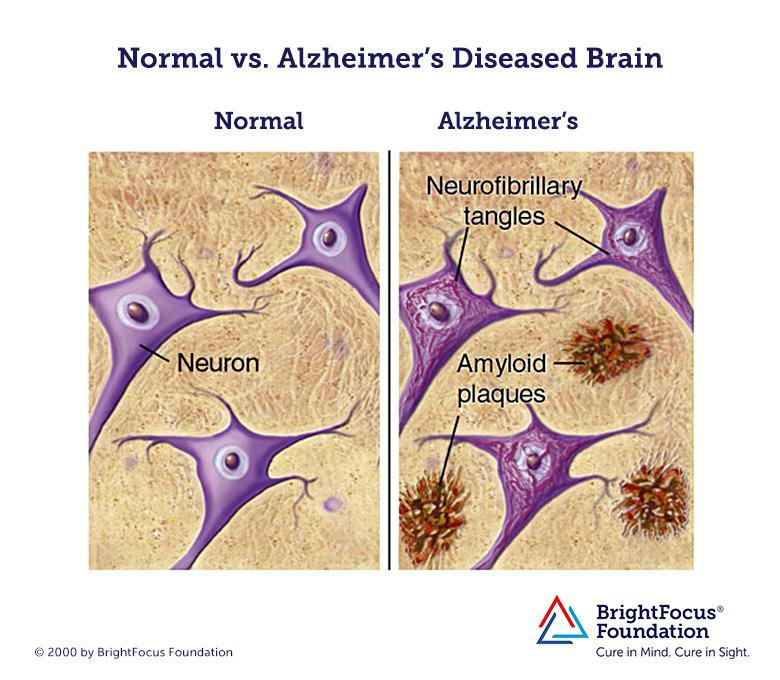 These plaques consist of harmful beta-amyloid proteins and other damaging cells that contribute to Alzheimer’s (5). Animal and test tube studies show that APOE plays a role in the accumulation of beta-amyloid proteins. For example, in mice more accumulation occurred in those with APOE4 compared to other APOE forms (6). Additionally, among people who died from Alzheimer’s, those with two APOE4 alleles had more amyloid plaques in the brain than others (7, 8, 9). In fact, even people without any cognitive impairment have more beta-amyloid protein in their brains if they have the APOE4 allele (10). Researchers speculate that APOE4 increases clumping together of beta-amyloid proteins, or that it prevents it being cleared from the brain. Summary: It’s not clear why APOE4 increases Alzheimer’s risk, but it may influence the formation of harmful brain plaques that are a common feature of Alzheimer’s. Mediterranean diet (more on that below). We can use this as a rough guide, but most of the evidence is not strong. 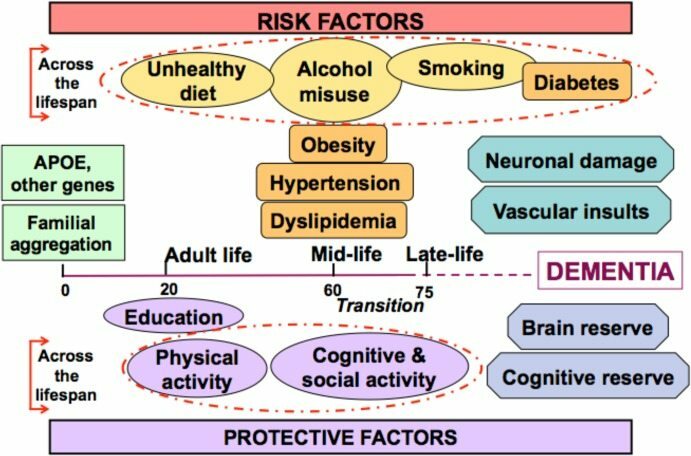 For example a diet high in saturated fat is linked with Alzheimer’s risk, but that may be because junk food is typically high in saturated fat. Would we still see the link in whole foods naturally high in saturated fat, like meat or dairy? Additionally, specific nutrients (such as antioxidants or omega-3 fats) may not reduce Alzheimer’s risk when consumed individually. That is, nutrients may need to be eaten as part of whole foods to have an effect, known as food synergy (12). 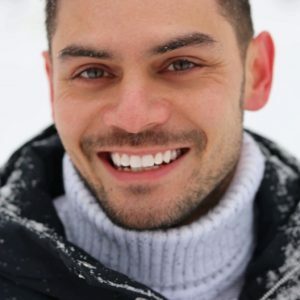 A Specific Diet For Those With APOE4? Those with the APOE4 allele may have a more exaggerated response than normal to certain nutritional risk factors. That means a healthy diet is “extra” healthy, and a harmful diet is “extra” harmful. One study followed almost 1500 healthy people for 21 years to see who would develop Alzheimer’s in later life. 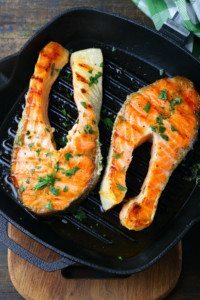 Those who ate a diet low in polyunsaturated fats (omega-3s and omega -6s) and higher in saturated fats had an increased risk, but that risk was amplified further in those with the APOE4 allele (13). 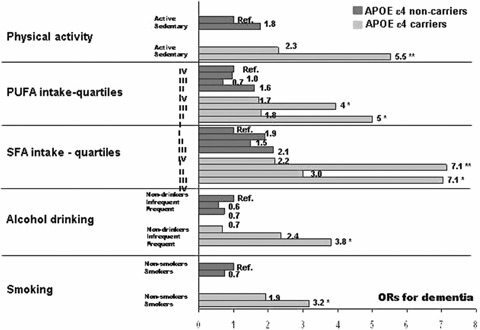 Combined effects of various lifestyle-related factors and APOE4 carrier status for dementia. Click to enlarge. Image source. In fact, APOE4 carriers who ate the most saturated fat were 7 times more likely to get Alzheimer’s than non-carriers who ate the least saturated fat. Summary: Current evidence can be used to form some general guidelines, although they are not set in stone. It’s likely those with an APOE4 allele respond more dramatically to nutritional factors than others. The two most popular eating patterns for Alzheimer’s prevention and/or treatment are the Mediterranean diet and ketogenic diet. Based on the above information and some specific studies, we can make reasonable assumptions about their effectiveness. 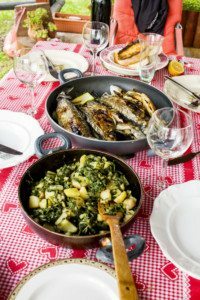 The Mediterranean diet is based on traditional foods that those in countries like Greece and Italy ate around the 1960s. This eating pattern is strongly linked to a range of benefits including a reduced risk of obesity, various types of cancer, heart attack, stroke and Alzheimer’s. In fact, those who best adhere to a Mediterranean diet are linked to a 33% lower risk of developing Alzheimer’s compared to those who don’t (14, 15). It also correlates with the current Alzheimer’s disease recommendations of reducing saturated fat, increasing omega-3 fats and vitamins and minerals. There this diet appears the best for Alzheimer’s prevention, based on the current (albeit limited) evidence. The ketogenic diet (also known as keto diet) is a very low-carb, high-fat eating pattern. There is a lot of research into its effects on brain health, particularly Alzheimer’s. 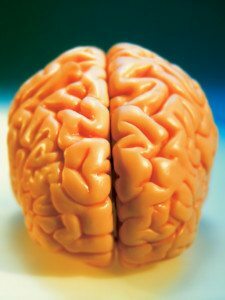 Our brains use glucose (carbs) as their main fuel source. If glucose is not available, the brain can switch to using ketones. In Alzheimer’s disease, the ability of the brain to use glucose for energy is impaired. However, its ability to use ketones remains equal to that of a healthy brain (16). Hence the potential benefits of a ketogenic diet in Alzheimer’s sufferers, which intentionally restricts carbs to produce ketones. Both animal and human trials have shown ketogenic diets have slight beneficial effects in mild-to-moderate Alzheimer’s disease. Studies that directly supplement ketones in the form of MCT oils (maybe even coconut oil) have also been promising (17, 18). 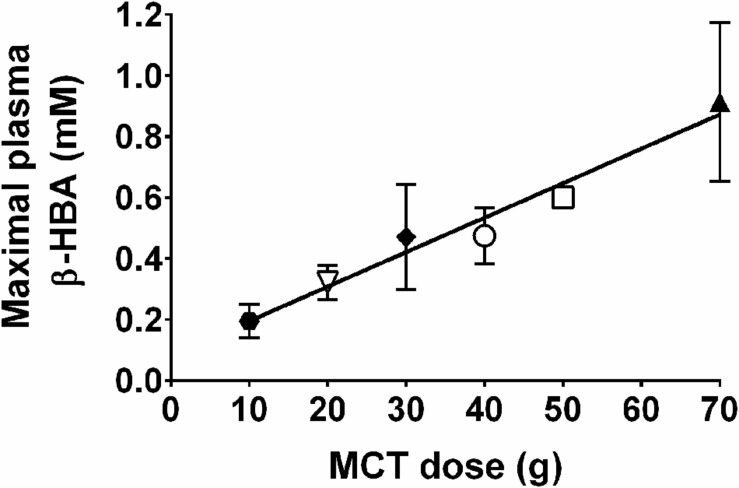 Relationship between oral dose of MCTs and maximal observed β-HBA (ketones) measured. Click to enlarge. Image source. Unfortunately, early studies indicate that cognitive improvements from MCT supplementation are weaker in those with APOE4 variations. This suggests a ketogenic diet and MCTs may not be as effective in APOE4 carriers (19, 20). Additionally, it’s especially difficult to adhere to long-term because it’s so restrictive. Summary: The Mediterranean diet has many of the nutrient characteristic thought to help prevent or delay the onset of Alzheimer’s. A ketogenic diet and MCT supplementation may benefit those already affected, but it’s difficult to stick to long-term. Additionally, it may not be as effective in those with with APOE4. Having the APOE4 gene variation is a risk factor for late-onset Alzheimer’s disease. It likely has something to do with the way the APOE protein (produced by this gene) affects brain function and plaque formation, although scientists are still learning more. Based on current evidence, the best way to lower risk is with a Mediterranean diet. This eating pattern likely provides nutrients that work together to decrease risk. The effects may even be exaggerated in APOE4 carriers. A ketogenic diet may help lessen symptoms for those who already have mild-to-moderate Alzheimer’s. However, it may not be as effective in APOE4 carriers and is a very difficult eating pattern to stick with long-term. If you or a loved one has been diagnosed with Alzheimer’s, talk to your doctor or dietitian about the best diet for you. If you are worried that you or a loved one may be experiencing symptoms of Alzheimer’s, talk to your doctor. Where does one go to get tested for this gene? How is it done? DNA Life is a genetic test that tests for APOE variants, among a whole host of other genes that can be effected by lifestyle, diet, and targeted supplementation. It is done by Nordic Labs overseas. The purchase price includes a skype consultation by a trained practitioner. I’ve had both “23 & Me” and DNA Life done. 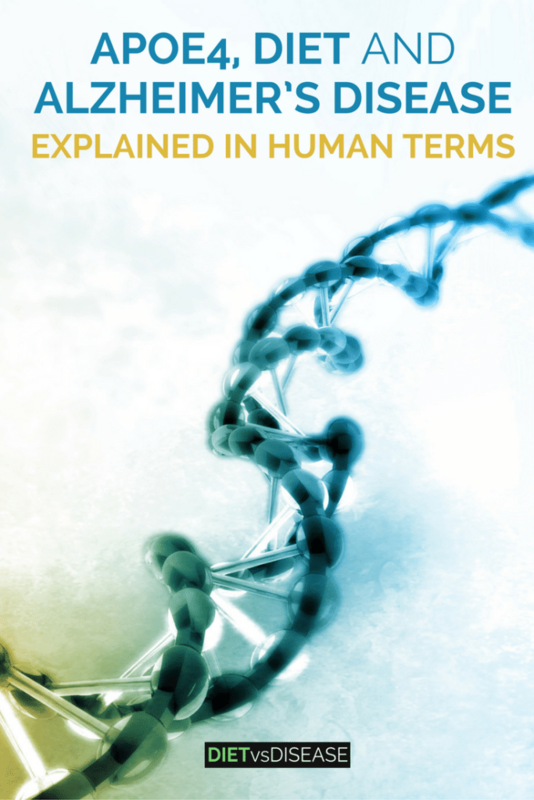 DNA Life provides a wealth of information and free consultation. It is much more understandable & useable than the “23 & Me” raw data which needs to be analyzed by a functional medicine practioner. That can be quite expensive and difficult to access in some areas. My husband and I have both had DNA Life done. We have made substantial shifts in diet, lifestyle, exercise, and use of targeted supplements, according to our individual gene variants. You get a PDF file of all your test results, summaries, highest priorities that need support, suggestions, and “next steps”. The purchase, delivery of the kit, instructions, and return shipment were seamless. Results and a skype consultation were completed in approx. 3 weeks after their receipt of your cheek swab at Nordic Labs. You do not want to use 23andMe unless you give a fake name and pay using a prepaid debit card which you can purchase with cash.Do not pay with your own credit or debit card, they can trace it to you. The company was started by the wife of the founder of Google. They collect and sell your gene information to other private companies. You can ask your physician to order a complete gene sequencing. Medical records are still supposed to be relatively private. Do not have access to your medical records via a medical portal, it is too easy for hackers and others get to your medical history through a medical portal. You have the right to your medical records, just go to the hospital or clinic sign a form and get a paper copy. I get a copy of every test I get done and keep them in a ringbook at home. Medical records can be discarded after 7-10 days and sometime even sooner. That should read. ” they can be discarded after 7-10 years “. ApoE 3/4 and 4/4 are better off avoiding animal fat, especially saturated fat. They will reduce their risk of Alzheimer’s by following a vegetarian or even vegan diet.